Delightful, rounded shrub combines delightful fragrance, pretty blooms and eye-catching yellow fall foliage. Carolina Allspice, also called Sweetshrub and Strawberry Bush, is native to the United States and easy to grow. 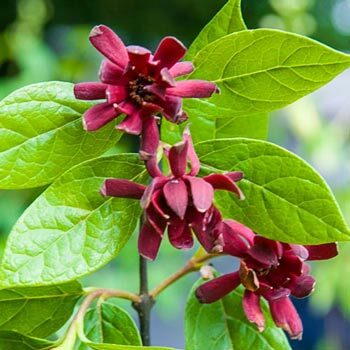 This deciduous shrub produces reddish-brown fragrant blooms that have hints of pineapple, strawberry and banana. The flowers give way to urn-shaped fruits which mature in the fall. Its dark green, lustrous leaves are aromatic when crushed and, in autumn, turn yellow. Because of its lovely fragrance, many gardeners plant this shrub near patios and entrances where its fragrance can be enjoyed. It's also a good choice for shrub borders and foundation plantings. Foliage Type: Deciduous, lustrous, dark green foliage. Oval to oblong, 5 - 6" long. Very bold, golden-yellow fall color. 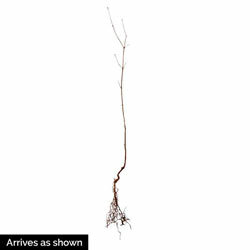 Flower Form: 2" blooms at the end of short branchlets. Planting Instructions: Set at the same level it is growing at in the container, firm soil and water thoroughly. Soil Requirements: Well-drained, organically rich, moisture retentive soil. Pruning: Prune after flowering to keep plants neat and tidy by removing dead or damaged branches. Winter Care: Apply mulch to maintain soil moisture. Additional Information: Unique form of a superb native shrub. Locate near a door or pathway to best enjoy its fragrance.